No Trace: Bags | Wraps | and Linens handmade with zero waste. Maybe you’re hoping to fit all your year’s trash into a pint-sized mason jar that you’ll put in the middle of your mantle, next to your karate trophies, in your living room. Or maybe you want to put your bulging trash can on the curb only twice a month instead of every week. Or maybe you’re sick of rinsing out and drying plastic bags from your kids’ lunches every night, worrying about what might be leaching out of the bag and onto their cheese sandwiches each day. Either way, No Trace wants to help you reach your goals with sustainable lunch and veggie bags and wax wraps. Most of that ends up in a landfill. Landfills don’t let things to decompose, causing trash to pile up and up and up. I visited the Santa Cruz landfill and saw trash heaps taller than 3-story buildings. And dump trucks just pouring more out onto the piles. Trash in the landfill leads to greenhouse gases (methane). Landfills can pollute our drinking water. And you probably know that we’re running out of room for our trash – in the U.S. and globally. You care that every piece of garbage in the landfill is a loss of resources. A loss of energy. A small failure of our society. You know that we need better systems in place to cut waste. Imagine that you could wave a magic wand and not make any more waste. What trash would disappear from your trash cans? What would show up in your cupboards, fridge, and bathroom cabinets? What if there were steps you could take that don’t require a magic wand? Switch to sustainable bags and wraps by SHOPPING HERE. No Trace helps you live a sustainable lifestyle. Read the blog for tips on transitioning toward zero waste. 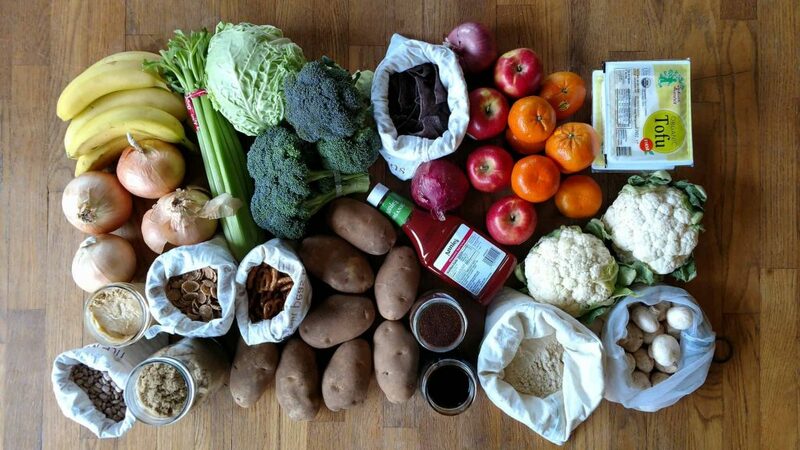 Switch to plastic-free, all natural bags for shopping for and storing your produce. Usecotton bagsfor your bulk bin shopping and ditch plastics and packaging. 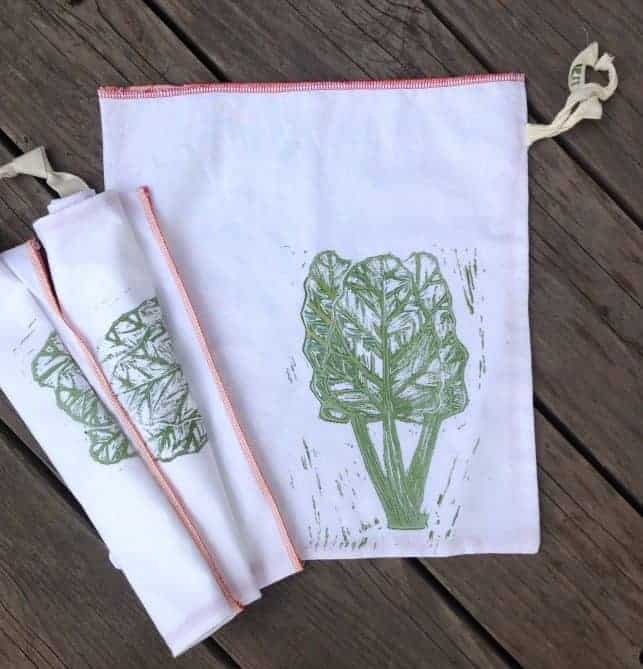 Every time I grocery shop, I fill my cart with upcycled cotton bags handstamped with pictures of fruits and veggies. Swap out plastic saran wrap for beeswax wraps and vegan wraps. An all natural, reusable, washable, and compostable alternative that sticks to your bowls and around your sandwiches. Stop buying plastic ziploc baggies and use organic cotton snack and sandwich bags instead. Use a reusable, plastic-free lunch bag. Carry a reusable napkin with you – say no to disposable napkins. Shop for goods handmade in Santa Cruz, CA with zero waste. Contact us for individual support in making the transition toward zero waste. Because sometimes you gotta eat your snack while driving your car from the office on the way to pick up your kids from school and shuttle them to dance lessons. Our snack bags and wraps help you take food on the go. Wrap up those carrot sticks in a beeswax wrap and pop them into your purse. All bags are made with 100% natural, biodegradable materials and can be reused over and over again. Once they’ve reached the end of their usable life, they can be composted in your home compost bin. Scoop that bulk rice and bulk beans right into your cotton bags and cinch them shut tightly with the drawstring closure. Put that fresh, damp lettuce straight into a cotton bag and then directly into your fridge after grocery shopping. You don’t need any plastic bags to store your food. Avoid bisphenols, phthalates and other possibly toxic chemicals that can leach from plastic. No Trace bags are made with 100% natural fiber and biodegradable materials and can be washed and reused many times. Bonus: No Trace bags won’t release any microplastics when you wash them! Want to find ways to reduce your or your small business’ waste? Want help zero waste grocery shopping? Want less wasteful packaging options for your product? Would you like a custom made bag for your business? Contact us to find out how we can help! We offer individual consulting and custom orders. Contact us to see if we can help you in your journey.